The Nina and the Pinta sit docked in front of Gallipolis waterfront area with visitors lining up to see the historic ship replicas before they set sail again after Wednesday viewing times ending at 5 p.m.
GALLIPOLIS — A sailing museum made of a pair of replicas of Christopher Columbus’ ships, the Nina and Pinta, have drawn thousands to the Gallipolis Public Use Access waterfront dock. The ships first opened for touring in the Gallipolis’ dock on Nov. 2. 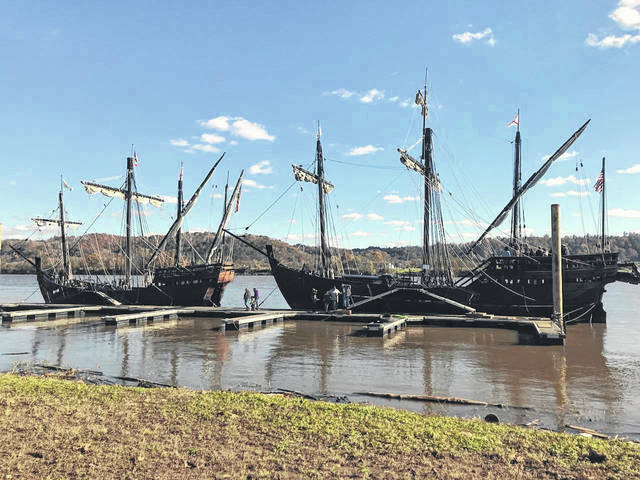 “We had approximately 30 group tours scheduled, 15 plus per group, for an estimated total of 4,000, during the Nina and Pinta visit,” said Gallia Convention and Visitors Bureau Executive Director Amanda Crouse. Hicks said among the shipwrights who constructed the ships were Portuguese who were reportedly eighth generation builders. The Nina first set sail in 1991 while the Pinta first set sail in 2005 after also being built in Valenca. Both ships are considered of the caravel type. Each should took roughly three years to build. Hicks has been part of the ships’ crew for three years. In larger bodies of water, the ships will sail. In smaller areas, both ships do carry engines to assist in movement. The Columbus Foundation is dedicated to educating visitors to the sailing of caravels and the history behind Columbus’ voyage. The ships will be open until 5 p.m. Wednesday before moving to their next location in Ashland, Kentucky.